We've seen a few brief gameplay snippets of Bombshell, but now we've got a full ten minute gameplay video to sink our teeth into. 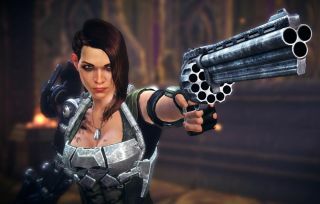 Formerly a Duke Nukem ARPG before Gearbox caught wind of it, all evidence suggests that the Duke DNA is still intact, only now the protagonist is a woman named Shelly “Bombshell” Harrison. See what they did there? The video above was rolled out to coincide with QuakeCon, which is taking place right now. Bombshell is expected to release later this year.